In 1981 I was a pupil at an inner London comprehensive school. Around 75% of my classmates were black, and the remaining quarter were mostly white, Indian or Pakistani. Many of my classmates had been stopped and searched by the police under the infamous SUS laws, under which the police merely had to believe that a person was acting suspiciously. Many more of their fathers, elder brothers and uncles had been stopped and searched. Many of these had been racially abused, falsely arrested and/or beaten up. The police were a law unto themselves. Complaints about police behaviour were handled by… well, the police of course. And the mass media still lived in a complacent bubble dating from an earlier age where the police were never corrupt, racist or unnecessarily violent. The worst police behaviour came from a gang called the Special Patrol Group (SPG), who regularly beat up (and sometimes killed) people without fear of punishment. The London of 1981 was far less racially mixed than it is today – black and Asian people were concentrated into certain areas, and white estates were no-go areas for them. The far-right fascist National Front (NF) would march through racially mixed areas as a provocation, and in any resulting violence, the police always took the side of the NF. It was no surprise to me or my friends, but a huge shock to most of the UK, isolated from the black inner city, when the Brixton riot erupted in April 1981. Brixton had been subjected to “Operation Swamp”, during which the number of stop-and-searches rocketed. Ostensibly this was an attack on crime; in reality it was the invasion of Brixton by a racist, violent gang. Of the many stories circulating at the time, a minor one stays with me for some reason: during a raid on a black house, the police smashed a guitar and a TV set, claiming they were looking for drugs inside. The people of Brixton (and other black areas around the country) were being deliberately wound up into a rage, which became all the more consuming for lack of any means of dealing with it. There were few black or Asian people in the police force or media, and even the most well-meaning news outlets had no idea what was going on. When Brixton exploded, so did other areas of London, Birmingham, Bristol, Liverpool and other cities. A few blocks of Brixton became a police-free zone for three days, defended at “the front line” on Railton Road. At the front line, people defended the area. Inside was a carnival, celebrating freedom – a police state had been temporarily liberated. Some of my older friends travelled to Brixton to witness or join the festival. People of all races partied and battled the police together; despite propaganda at the time, this was no race riot – it was a community uniting against the police. Yes, there was mindless looting and burning, despite the efforts of older community leaders. Once all respect for law and order has collapsed, this can only be inevitable. After the dust had settled, the government response to the riots was very British and remarkably level-headed. An inquiry was called under the leadership of Lord Scarman, and later the same year, the results were delivered. Scarman found clear evidence that the police were using stop-and-search powers indiscriminately against black people. 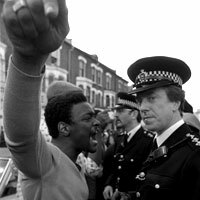 The law was changed in 1984, putting new controls on police behaviour, as a direct consequence of the Brixton riots. Other incidents, most notably the racist murder of black teenager Stephen Lawrence (which the police barely bothered to investigate) changed the public and media perception of the police, and things slowly changed for the better as scrutiny and control improved. By the late-1990s, the street confrontations of the 80s seemed to have faded into history. Then came 9/11. One of the many after-effects of those attacks (although Britain at that stage had never been under threat) was a massive increase in stop-and-search against young men, primarily black and Asian (though affecting whites as well). Within months, the friendly new face of the police had morphed back into something resembling that of the 1980s. I noticed an increase in sirens – and since there was no terrorist threat until after the Iraq invasion, I wondered what all those police were doing with their new-found anti-terrorist powers. The answer: they were stopping and searching hundreds of thousands of young men. In all this time, not a single terrorist suspect has been caught using stop and search. But the result has been an increased hatred for the police among young Londoners. Stop and search is often accompanied with verbal abuse and heavy-handed treatment. The old, violent SPG was dissolved in the 80s, but its successor, the Territorial Support Group (TSG) was becoming known for the same tactics. Incident after incident has come and gone in the past decade; hundreds of people have died at the hands of the police, and countless thousands have been verbally, racially and physically abused. A young relative of mine was assaulted twice by the police: once slapped across the face, the second time thrown against the side of a van. In neither case was he accused, formally cautioned or arrested for anything. To middle-class Britain, these are just unlinked, isolated events. To people in the inner city, the reported incidents are the tip of the iceberg. Over 300,000 black and Asian people were stopped and searched in the UK during the 2008/09 reporting year. At what point does normal policing activity tip over into the directed acts of a police state? I’d guess it lies at somewhere much less than 300,000 stop-and-searches in a single year. Deaths at the hands of police come and go, in their hundreds, usually with little mention, but one death did receive media attention: the curious “self-stabbing” of reggae star Smiley Culture in March (which I blogged at the time) led to a march in London, and the uniting of various family campaigns, each one having been previously isolated. The death of such a high-profile black man led to a massive increase in community anger. If they could get away with this, what couldn’t they get away with? And then last Thursday, Mark Duggan was shot dead. The Metropolitan Police immediately reported that there had been an “exchange of fire”. Yesterday, this was revealed to be untrue – not for the first time, the police had leaked a false story, only to have it overturned days later. Only two shots had been fired, both by police officers. On Saturday, a peaceful protest march was held; peaceful, that is, until a 16 year old girl who confronted police was attacked with batons and riot shields. That was the trigger for everything that followed. Incidentally, look at how effectively the police lie-machine works. Below are tweets from two police officers. I’ve no doubt that these individuals genuinely believed what they were tweeting – but they were part of an effective propaganda operation that is put into action every time the police kill somebody. For those that point out the shooting of Duggan or the attack on the girl are no excuse for the destruction that followed: please stop stating the obvious. Everybody realises this, especially the people who live in those areas. The vandals, looters and muggers must be caught and face justice – that goes without saying. But Londoners also know the rage that exists against the police, on a huge scale. It’s inevitable that mindless morons will take advantage of chaos and begin looting and burning. It happens whenever a riot starts, for whatever reason. It’s a symptom of the situation, not a cause. I’ve been deeply disappointed with the number of suburban progressives and middle-class Londoners who have swallowed the media spin completely. The looting is a side-product of a much bigger story, the descent of post-9/11 Britain into a form of police state, at least for its poorer populations. Last week’s shooting wasn’t the reason for the uprising. It was simply the last straw. Now we have to defend against our moron government giving police even more leeway to “restore peace” in London. Stop-and-search, coupled with abusive policing, got us here, as it did in 1981. Don’t let them justify even more of the same by the use of fear tactics.